I know that the whole poem wouldn’t connect to what I’ll be talking about right now. But this line describes the days, most days, where I find myself having no purpose to live through anymore. There are days that when I wake up I would find myself wondering why I have to do the things that I do everyday. Like going to school, talk to people, and others. And I would ask myself why can’t I just lay down all day long and stare at ceiling and think about stuff until I fall asleep again. 1.) Mum wouldn’t be happy about me laying around all day doing nothing and neglecting all my responsibilities (i.e. house chores). She’d call me lazy again for chrisssake. 2.) I can’t just skip school whenever I want to because I don’t want to disappoint my parents with my failed grades ever again. 3.) Doing nothing may make me feel fine for a while but would make me feel worthless and guilty for wasting time and for not doing something productive later on. These are only the few things I could remember right now. It’s not easy to disregard what I’m going through inside me. But I have to…every single day. To make things normal. At least on the outside. To not cause problems or to burden to others. I have to push down deeper within me whatever negativity that I feel (I don’t want it. This negativity is just simply there.) Just to make myself somehow feel better. But at the end of the day, when I’m alone in my room, I would realize that I’m exhausted. Not physically. But mentally and emotionally. It’s so hard pretending that I’m fine. I would almost believe that I am sometimes. But at night I realize that I lie to myself too much that when I’m alone my inner self would confront my façade and would remind me of the truth. It’s that I’m not totally okay. But the thing that keeps that thought away is that evryone is a little broken inside right? I do feel genuinely happy sometimes. It’s just that it’s not enough to fill the emptiness that I feel all the time. Someone told me yesterday that if something going on within me I shouldn’t go around affecting other people. I was feeling a bit distant and irritable yesterday that’s why she told me that. And it made me go back to thinking that yes maybe there’s going something real within me. This problem is not something I’ve been imagining. Maybe it’s real. And I’ve just been running away from it I don’t to believe that it’s real. I realy do wish I had someone to talk to about it. It doesn’t matter if he or she’s a professional or not. As long as they would understand and not think less of me because of this. Maybe I’m just paranoid. Maybe I’m not. I really don’t know. If I haven’t read a single book, I think I would be a limited person today. Limited in the sense that I wouldn’t have known about the things I would not learn about on a normal basis. Reading is something that keeps me sane and insane at the same time. Sane, because I can’t live without reading. I have to have a book with me in my bag all the time. Insane, because there are times that I seem t live in a different world. I think differently. And whenever I impart some of my thoughts to my friends, some of it, they can’t register in their minds. Or they would think it would be too unusual and sometimes think that I’m weird to even think it. It’s not that I think their dumb or I’m dumb or something. It’s just that we’re different. They are too attached with the reality of life. 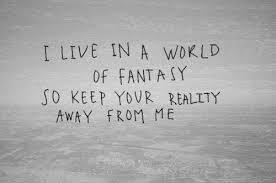 While I occasionally detach myself from reality and chooses to live in fantasy to take a break. Reality is too energy draining. Being with a group of people the whole day is energy draining. That’s why when I get home it feel so good to lie on the floor and just lay there. And then my mind starts to wander. And that’s one way how I take a break from reality. Another way is to read a book or write a new post for my blog or watch tv. A lot of choices really. The bottom line is that I must be alone. Not a lot of people would appreciate being alone. Walking around the campus, or the malls or anywhere in general, alone. But I do. I enjoy it a lot. When I transferred to this new university, I spend my vacant hours alone. Of course. I go to the mall, roam around, read a book at the foodchain where I eat my lunch. Or I stay at this short corridor in the of a building where it’s not reached by the sunlight and it’s heat. I love it there. The wind is cool and the place is quiet. I like the quiet. I didn’t make friends right away because I didn’t need one. I have my closest friends already and I believe that they are enough. I interact with my classmates of course, whenever it’s needed. And some of them I got to know deeper just by being their seatmate. I don’t know why but people tend to open up whenever they talk to me. I don’t even ask them about theor stuff. I really don’t like getting personal with a new person. Who does anyway? But they tell me things. I’m not sure if those people noticed it but I don’t share the same thing they shared to me. I maintain a shallow relationship with them. I want us to remain aquaintances. But as I stay longer in this university, more people grew familiar with me. We greet each other everytime we cross paths but most of it are awkward. But it doesn’t matter anyway. There’s this person that I know before because we were classmates in one subject. We never got close, nor became friends. We became classmates again. This time, this person wants us to be together almost all the time. This person wants us to have lunch together, do things together, and wants me to wait for her. Do things for her. And I really dislike compromising. I like doing my own stuff but with her with me, I don’t get to do my stuff anymore because she’s the one who’s got to have her way. At first, I was okay with all of it. But as days go by and I think she’s getting worse with her being bossy, I’ve turn very robotic. Like, whenever we have conversations, I reply in a robotic way. No emotions attached to it. No actual care in it. I don’t know if it makes any sense but I feel that way. It’s like I’d rather feel no emotion at all than feeling mad at her. I feel like I’ve been utterly compromised. I don’t even have the time to read my book anymore. I don’t have my time alone. I can’t stay in my favorite corridor anymore. I’m not a good talker so there are a lot of awkward silence and then she’d ask me to think of a topic so that we won’t be bored. Well, sorry miss I’m a boring companion, I’m not the type to be initiating conversations. I just answer and react. And I really feel uncomfortable whenever I’m with someone and we’re not talking.it feels awkward. I mean, it’s fine being silent together as long as there’s no awkwardness and pressure. I’m a very patient person. I don’t judge right away. I go beyond the negative things a person possesses. I hope I would have more patience with this person and that I don’t snap at her. I’m chill. Most of the time i’m chill and I don’t want negativity in me. I’m not anti-social. But being with a lot of people and interacting with them exhausts me. I don’t know why. Well, I’m an introvert, maybe that is why.